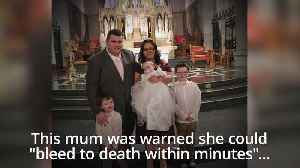 Warned she could 'bleed to death within minutes', Kellie Cantwell was gripped by terror and heartache after doctors discovered her unborn baby had attached itself dangerously close to her C-section.. The Plucknette family was on Jimmy Kimmel Live! to tell the tale of five-year-old Teddy taking the clippers to all three kids' hair.